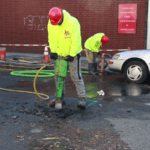 Late Tuesday afternoon Harris Water Main & Sewer Contractors received a call regarding a clogged sewer line on the west side of Manhattan, the tenants had been smelling sewer gases for two straight days. 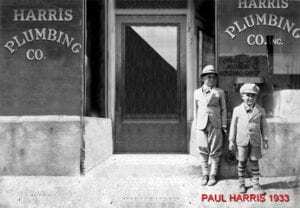 The management company was advised to call Harris Sewer as they were spotted working on a nearby house one week prior. 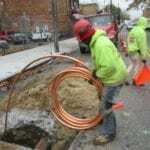 The managing agent stated that their plumber had tried to unclog the line with a sewer snake and a water jet, at this point the pipe was diagnosed as non-functional and had to be replaced. 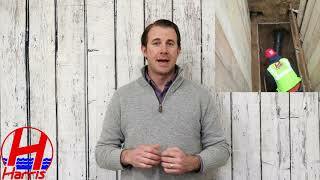 Harris arrived on site to find what was the typical brownstone on the West Side of Manhattan. 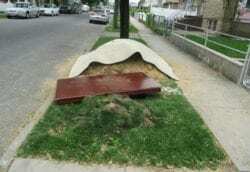 The basement was vaulted to the curb and the city sewer was 11’ deep in the roadway. 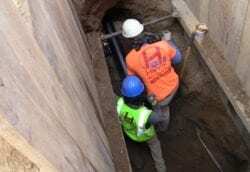 The buildings sewer line had to be replaced on an emergency basis due to the five families currently living without any use of their bathrooms. 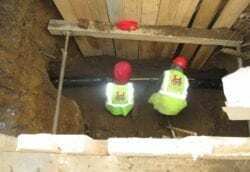 Harris notified the agent that the work would be started the very same night, and would continue to work throughout the night, until the new sewer line was installed. The sewer installation crew arrived on site by 7:30 pm and began digging in the roadway once the emergency DOT work permit was secured. 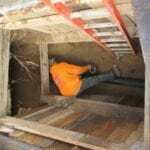 The installation team continued to dig and was seven feet deep in the roadway by 12:30. 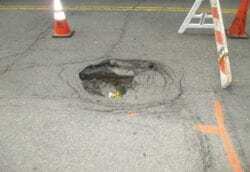 The excavation process required a large amount of digging by hand, as opposed to digging by a backhoe, due to other utilities in the roadway. 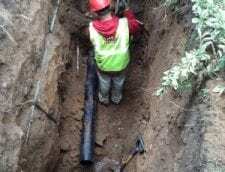 The crew worked nonstop throughout the night and finally had the new 8” cast iron sewer line in place, and fully functional by 7 AM the next morning. Like many other buildings, the existing sewer line was a 6” pipe. 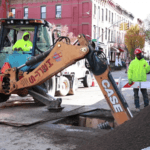 In Manhattan DEP requires an upgrade in all sewer replacements to be 8” cast iron pipe. 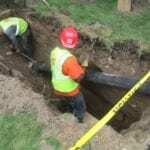 This differs from the other boroughs where a sewer replacement requires a 6” cast iron pipe to be installed. 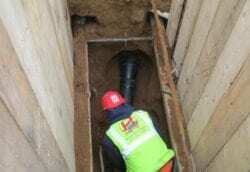 The DEP inspector arrived on site at 11 AM when he inspected and passed the new 8” cast iron sewer installation. At this point Harris back-filled the roadway opening with clean soil, while compacting and removing debris from the excavation process. 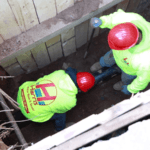 Harris Water & Sewer was able to resolve what was expected to be a multiple day process, all within 24 hrs. 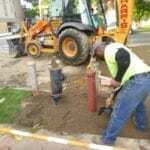 Contact Harris Water with all water main or sewer needs.